The Marvel universe and its Ultimate universe are ending. That's according to a recent press conference from Marvel comics, who finally solved the mystery of what's happening in their much-hyped Secret Wars event — and revealed the new universe that's going to result from it. According to Comic Book Resources, "Multiple announcements are planned over the next two weeks for more stories tying in to Secret Wars", so there's clearly more to come. Some sites are calling this a reboot of the Marvel universe, although Marvel is quick to clarify that all the history of the regular 616-universe still happened — it just remains to be seen how much of the 616 will be left once Secret Wars shakes out. For now, it seems that myriad versions of Marvel heroes will be existing simultaneously — as evidenced in this Thor-heavy cover to Secret Wars #2, due out in May. 1) The merging of the regular Marvel universe and the Ultimate universe does not excite me at all. It seems like Miles Morales has been popping in the official 616 a lot recently, and Marvel's basically been threatening to kill all of the Ultimate series off for years. This aspect seems anticlimactic. 2) Although Marvel swears Secret Wars isn't a reboot, this seems like semantics to me. Assuming the status quo changes at the end of it — and if Miles Morales is going to finally join the 616, or Gwen Stacy gets resurrected, or any major changes occur, which I assume they will — you can more or less call it a reboot, even if it's a very soft one. 3) Is Marvel just going to bring back original Captain America, Thor, and non-Superior Tony Stark at the end of Secret Wars? I hope not, but I find it weird that Marvel would make these big, daring changes to their flagship characters right before an event where all of reality can be changed... or reset. 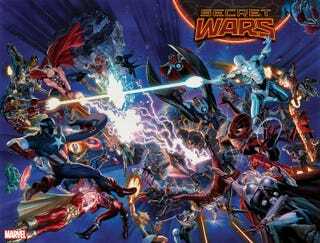 4) To be completely honest, I was hoping this was just going to be an updated version of the original Secret Wars, where the Beyonder plucked heroes and villains out of all realities and forced them to fight each other, as opposed to this "all universes crash together" thing it seems to be. 5) There is one piece of definitely groovy news that came out of this conference — the Marvel/Attack on Titan crossover over from Japan? It's going to be in Marvel's free Secret Wars primer on Free Comic Book Day! So that's cool.